Days after the collective involuntary bowel movement performed by London's Beijing-based 2012 organising team as they witnessed the spectacle of China's opening ceremony, Tessa Jowell has recovered enough to identify the area in which London will excel: getting bums on seats. Reckoning that there's no way our cupcake's icing will best the razzle dazzle that lit the Bird's Nest on Friday, the Olympic minister has claimed they'll attempt to fill every seat in 2012. 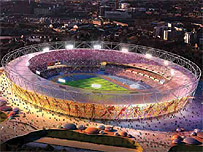 With worldwide audiences glimpsing less-than full stadia despite an official sell-out, Ms. Jowell says she is "learning lessons" from Beijing's organising committee on how to keep London's events looking as plump as (by then incumbent) PM David Cameron's cheeks.